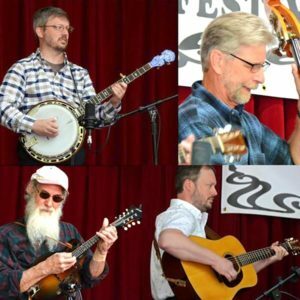 Shrewsbury – The Friends of the Shrewsbury Public Library in conjunction with the Shrewsbury Parks and Recreation Department are pleased to present Blackstone Valley Bluegrass. This seasoned group has built a solid and ever-expanding repertoire to go along with an engaging stage performance. In addition to a wide range of bluegrass styles, their powerful three and four part harmonies really set them apart. Pack a picnic and join neighbors and friends on Wednesday, August 1 at Dean Park. Concert begins at 6:00 p.m. and should conclude by 7:30 p.m.
Ice cream treats, while supplies last, will be sponsored by Shrewsbury Parks & Recreation and the Friends of the Shrewsbury Public Library. In the event of inclement weather, the concert will be moved indoors to the Shrewsbury Public Library, located at 609 Main Street.